Trials are hard and I can't think of anyone that enjoys them. And yet, God allows trials in our life to draw us to Himself, to burn off the sinful nature that still clings to us and to show more of Himself to us during those times. Most people when they find themselves in the midst of a trial become much more open to prayer, and believers especially, are drawn to the Word and prayer during difficult times. When we are in a trial by fire, we can know that we are not alone. Christ is with us in that fire just as He was with Shadrach, Meshach, and Abednego. If we hide under the shadow of the wings of the Almighty during those difficult times, people will see Christ walking in the fire with us. God is more than able to sustain us when we lean hard on Him. I Peter 5:7 NLT says, "Give all your worries and cares to God, for He cares about what happens to you." But it wasn't until recently that I read the following verses in conjunction with that one. Verses 8 and 9 say, "Be careful! Watch out for attacks from the Devil, your great enemy. He prowls around like a roaring lion, looking for some victim to devour. Take a firm stand against him, and be strong in your faith..."
In tough times, it is easy to be devoured by our thoughts and our worries, our endless anxiety and fear and yet, Christ, who is able to do exceedingly abundantly above all that we ask or think (Eph. 3:20) is more than able to once again shut the mouth of the lion so that we will not be consumed (see Daniel 6). During trials we must submit our requests to God with thanksgiving. Philippians 4:6-7 NLT says, "Don't worry about anything; instead, pray about everything. Tell God what you need, and thank him for all he has done. If you do this, you will experience God's peace, which is far more wonderful than the human mind can understand. His peace will guard your hearts and minds as you live in Christ Jesus." (This passage is put to song on this CD. It is one of my favorite songs because of this truth.) This peace according to Isaiah 26:3 is perfect and is promised to those who trust in God. We must choose to trust Him! Trials teach us not to worry, but to pray, and to say, "God, I trust you to bless me in the way you see fit." God is able to see beauty when all we see are ashes. Just as during a forest fire there are often devastating effects, afterwards new life takes the place of the dead and beauty is born. I know how hard it can be to trust God during difficult times, but if we do, and if we lean on His Word, we will see Him work in ways we never expected. His hand of blessing will be upon us and we will see Him fight on our behalf. At the very moment they began to sing and give praise, the Lord caused the armies...to start fighting among themselves. [They then] turned against their allies...and killed every one of them. After they had destroyed the army of Seir, they began attacking each other. So when the army of Judah arrived at the lookout point in the wilderness, all they saw were dead bodies lying on the ground as far as they could see. Not a single one of the enemy had escaped. King Jehoshaphat and his men went out to gather the plunder. They found vast amounts of equipment, clothing, and other valuables—more than they could carry. There was so much plunder that it took them three days just to collect it all! On the fourth day they gathered in the Valley of Blessing, which got its name that day because the people praised and thanked the Lord there. It is still called the Valley of Blessing today. Relinquishing control and choosing to trust rather than fear is never easy. But when we do, the path will be easier, the light will be brighter and our faith will be greater. The fire will burn the dross away and new life will flourish. 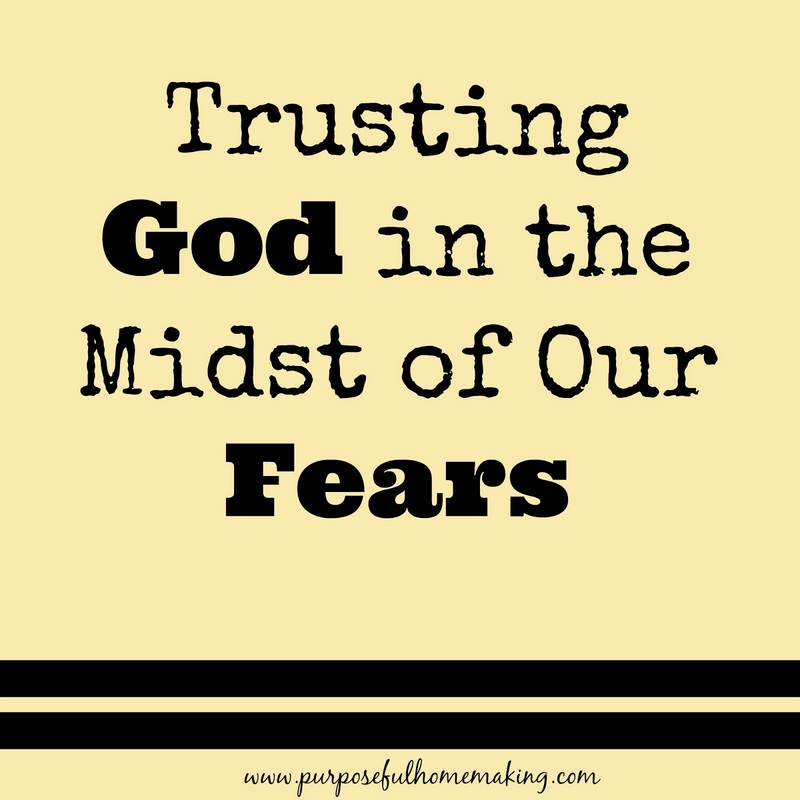 Will we choose to trust God in the midst of our fears and let Him bless us in the way that He knows is best? I saw the picture you used in this post and it immediately reminded me of God's blessing on our family just recently. A brooder full of spring chicks caught fire in the middle of the night and filled the carport with smoke and flames... even though we lost all, but 6 of the 100+ chicks in the brooder, the other one didn't catch on fire despite being less than six inches away and other than some black spots from smoke there was no damage to the rafters or the attic. 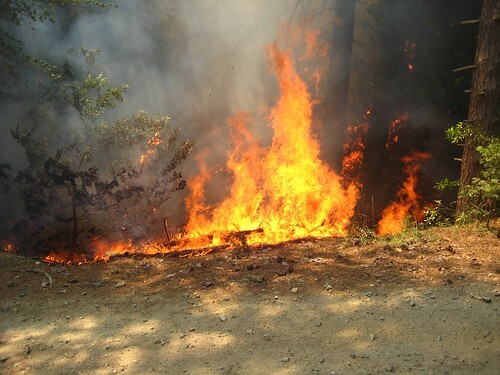 We live out in a rural area and the fire truck arrived 15 minutes after my dad and brother had put out the fire. I think we all felt God's presence that night and realized just how much He cares for us. Wow! I'm glad no one was injured although I'm sorry for the loss of all your chicks! Again, thankful for your safety!